AKRON — A mother knows best. At least that proved to be the case for Tippecanoe Valley senior Dakota Parker, anyway. 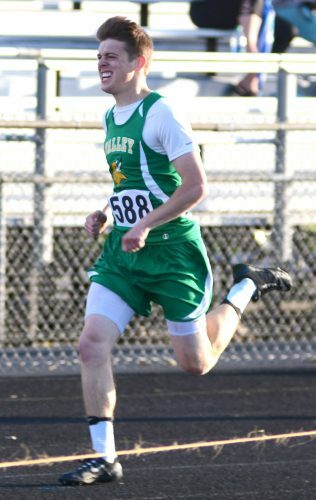 Already an anchor on Valley’s 4×400 relay team as a junior last spring, Parker envisioned himself as more of a short sprint specialist than anything else, and he devoted the rest of his time to the 100, 200 and 4×100 relay. He was successful in all of those races, to be sure, but it was only after some motherly encouragement to drop the 200 in favor of running the open 400 that he found his best event midway through the season. A finish at the state finals and a school record later, and he can only admit she was right. If Parker was hesitant to pick up another 400, it’s certainly understandable. The race is pretty much run at a full sprint pace the whole way, an entire lap around the track of lactic acid-inducing, lung-burning agony. Try to pace yourself, and you’ll fall too far back to make any moves in the homestretch, no matter how much gas is in the tank. It’s a contest of wills as much as one of speed and endurance. “To me, the 400 is the hardest sprint race there is because you have to sprint the whole thing. I always say the 800 is the hardest distance race because distance runners have to sprint the whole 800, and the 400 is hardest for the sprinters,” explained Valley head track coach Jenny Moriarty. “You have to build your endurance. It’s not just about the speed; you have to have the endurance to maintain that speed. You can be super fast for 100 meters, but can you maintain that for 400? That’s something that Dakota has, and even when he comes around that final curve it’s like he has another gear and kicks it in. If the 400 meters is a particularly brutal race, it’s also been a great fit for Parker. After only beginning his open 400 career several weeks into last season, he improved rapidly, already dropping his time into the 51-second range at the John Glenn Invitational in late April. Three weeks later, and Parker had set a personal record of 51.18 seconds on his way to claiming the Bremen Sectional championship. Then, at the Kokomo Regional the following week, he clocked 51.79 to edge out Three Rivers Conference-rival Jonah Lester of Peru for the third and final ticket out to the state finals in Bloomington. That regional run was a particularly memorable one for Parker and his coaches, as he beat out Lester by less than a quarter of a second — .24 of a second to be exact — and had to wait for the results to be announced to be certain he had made the top three cut to state. “At Kokomo, there’s a lot of people there watching. We were trying to find different spots to stand and cheer him on,” said Moriarty. “Coach Carlin — he is my sprint coach, and he handles the majority of Dakota’s workout — he was on the back stretch and he was trying to get around to the front to see because he couldn’t tell. Parker ended up finishing the year on a high note, recording a 51.02 stop at the Robert C. Haugh Track and Field Complex at IU to place 24th at the state meet and setting a school record in the process. It was a feel-good finish, but for Parker — a driven athlete who is known for staying after practice to put in extra work — one that brings with it the weight of expectations. Not content to rest on his laurels, he is now motivated to try to do even more. As the 2018 track season gets underway, Parker is a standout among a solid list of returners for the Vikings. Also back with the team is fellow senior Jameson Baker, a thrower who finished fifth in the shot put at the Kokomo Regional last year with a 49-10 throw. He’s joined by two more upperclassmen throwers in Will Hassenplug and Chase Browers, and Moriarty should be able to count on some steady points production in the throwing events. 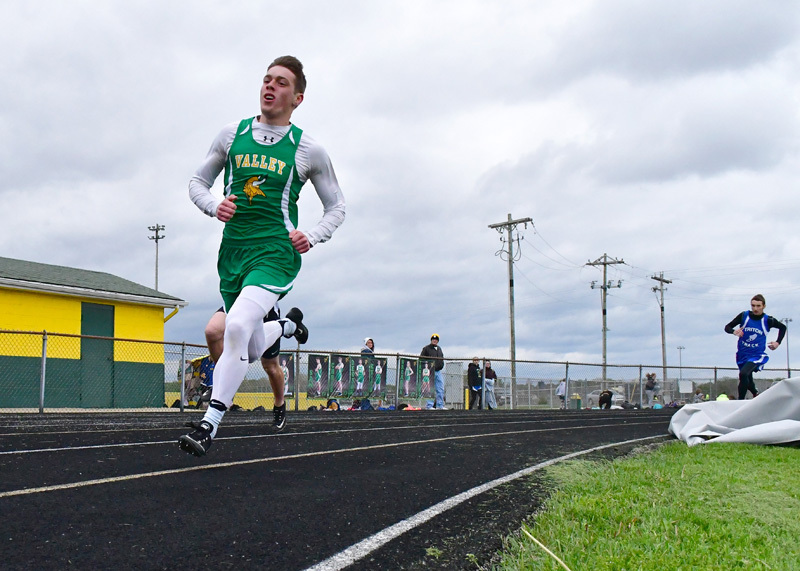 Whereas the Vikings were strongest in the sprints last spring, the graduation of Jared Mikel and Keith Wright left some holes in the 4×400 lineup to be filled. Senior mid distance runner Jordan Owens will fill some of that void and will be strong in the half-mile alongside Camden Tucker. Freshman Matthew Howes is a promising addition to this year’s squad and a valuable piece that Moriarty expects to be able to hold his own in any track event.